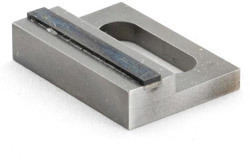 Polycrystalline (PCD) & Polycrystalline Cubic Boron Nitride (PCBN) diamond tools are manufactured using a synthetic (man made) diamond product. PCD is recommended for use on non ferrous materials and non-metallic applications were high abrasion resistance is required of between 45 and 60 Rockwell, where the chip softening produced by the cutting heat reduces the amount of cutting energy required and promotes chip removal. High content PCBN Tools are preferred for operations such as rough and intermittent cutting, while low content PCBN tools are recommended for fine and finish cutting. Examples of typical work piece materials are, metal matrix composites, aluminium and bronze alloys, copper, brass, ceramics, fibre glass, carbon fibre, graphite, plastics and rubber. The use of PCD Tooling offer the following advantages, long tool life, uniform surface finish, reduces machine down time, high material removal rate, and increases productivity, producing high quality parts. We offer a wide range of PCD Tooling including, turning, grooving, inserts, parting and boring tools as well as PCD Chisel Tools. We also offer a relapping/re-tipping service.